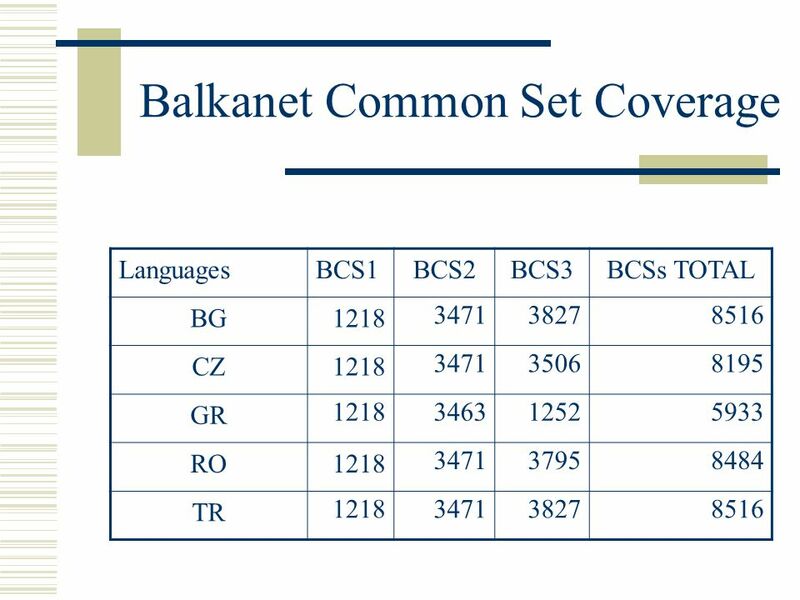 BalkaNet project overview Dan Tufiş Dan Cristea Sofia Stamou RACAI UAIC DBLAB. 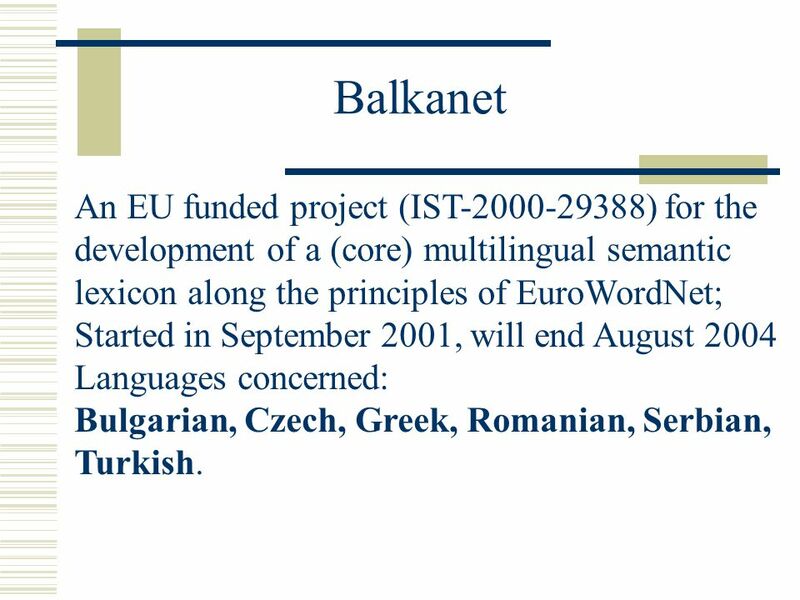 3 Balkanet An EU funded project (IST-2000-29388) for the development of a (core) multilingual semantic lexicon along the principles of EuroWordNet; Started in September 2001, will end August 2004 Languages concerned: Bulgarian, Czech, Greek, Romanian, Serbian, Turkish. 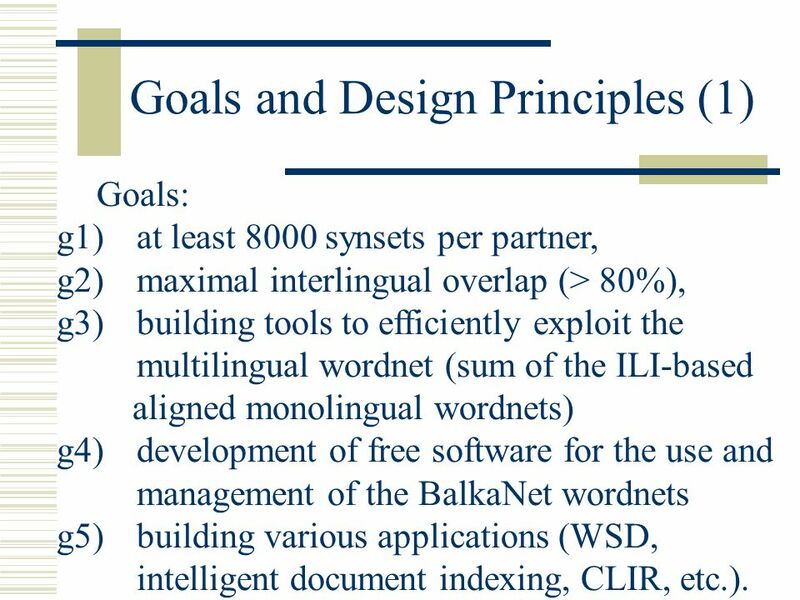 5 Goals and Design Principles (1) Goals: g1)at least 8000 synsets per partner, g2)maximal interlingual overlap (> 80%), g3)building tools to efficiently exploit the multilingual wordnet (sum of the ILI-based aligned monolingual wordnets) g4)development of free software for the use and management of the BalkaNet wordnets g5)building various applications (WSD, intelligent document indexing, CLIR, etc.). 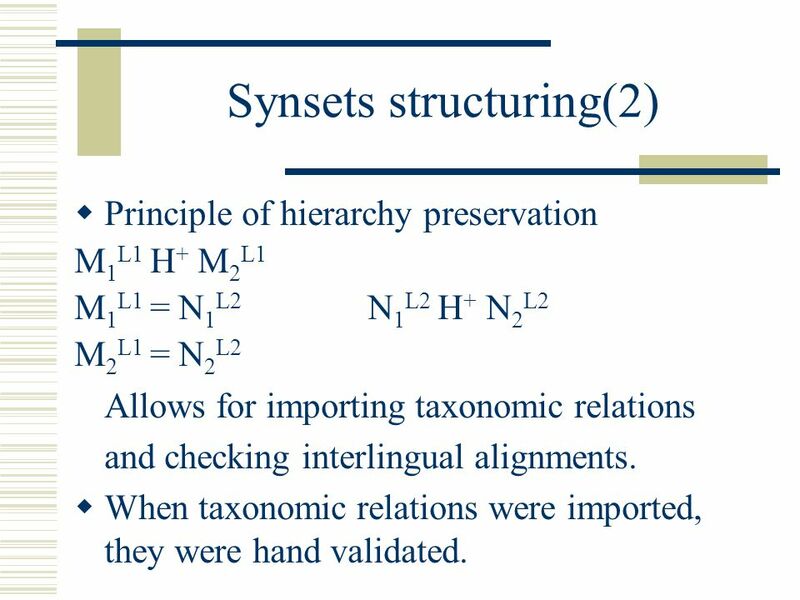 11 Synsets structuring(2)  Principle of hierarchy preservation M 1 L1 H + M 2 L1 M 1 L1 = N 1 L2 N 1 L2 H + N 2 L2 M 2 L1 = N 2 L2 Allows for importing taxonomic relations and checking interlingual alignments.  When taxonomic relations were imported, they were hand validated. 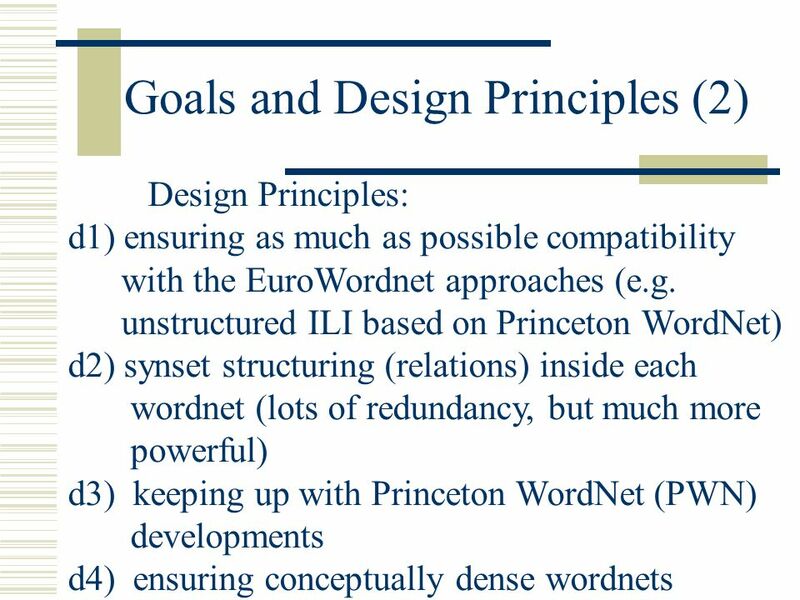 12 Keeping up with PWN developments  When the project started ILI was based on PWN1.5 (as EuroWordNet was). 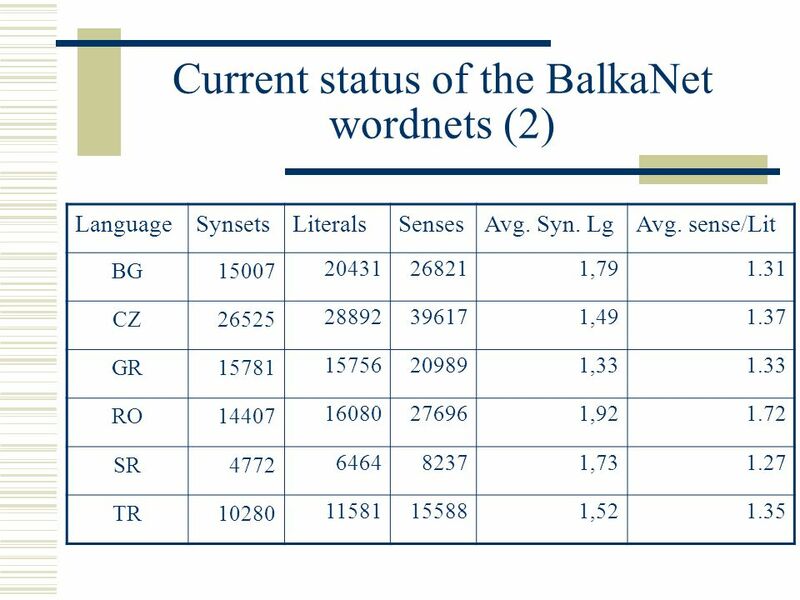  BalkaNet ILI was updated following the new releases of PWN: PWN1.5 => PWN1.7.1 PWN1.7.1 => PWN2.0  As the automatic remapping is not always deterministic the partners manually solved the remaining ambiguities in their wordnets. 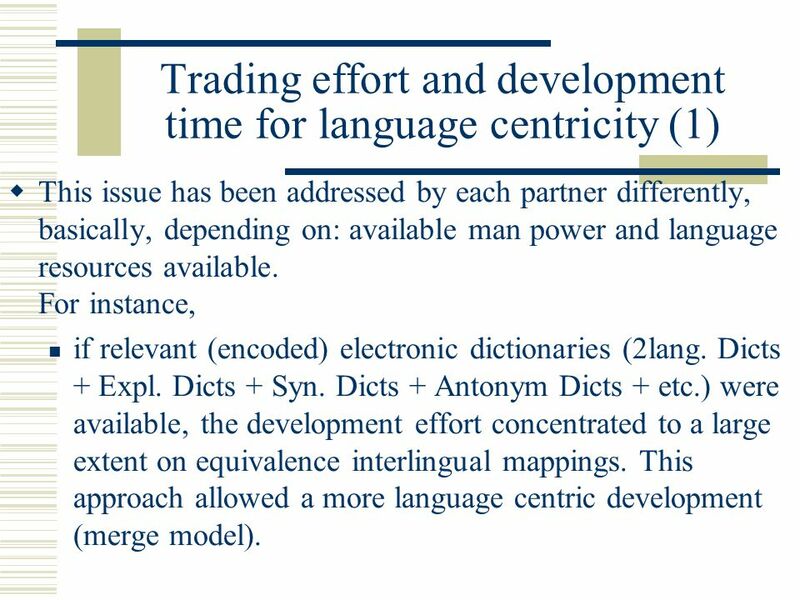 14 Trading effort and development time for language centricity (1)  This issue has been addressed by each partner differently, basically, depending on: available man power and language resources available. 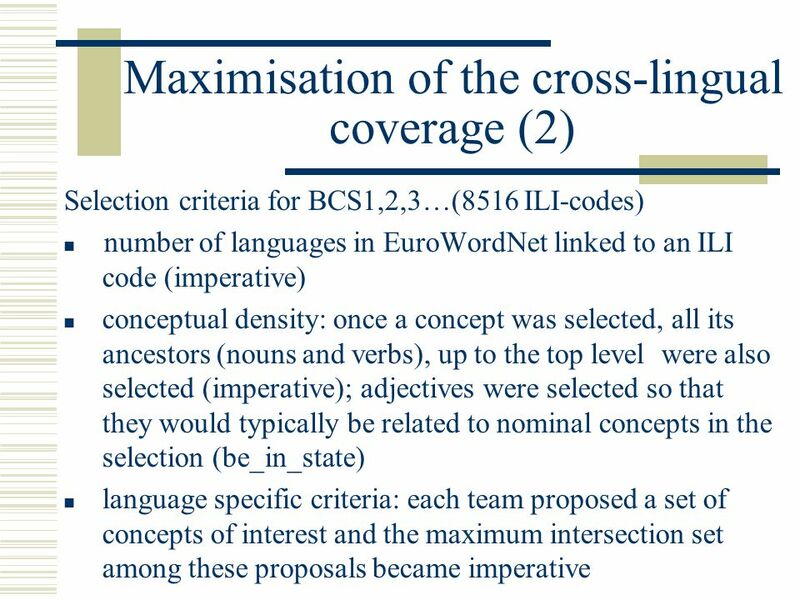 For instance, if relevant (encoded) electronic dictionaries (2lang. Dicts + Expl. 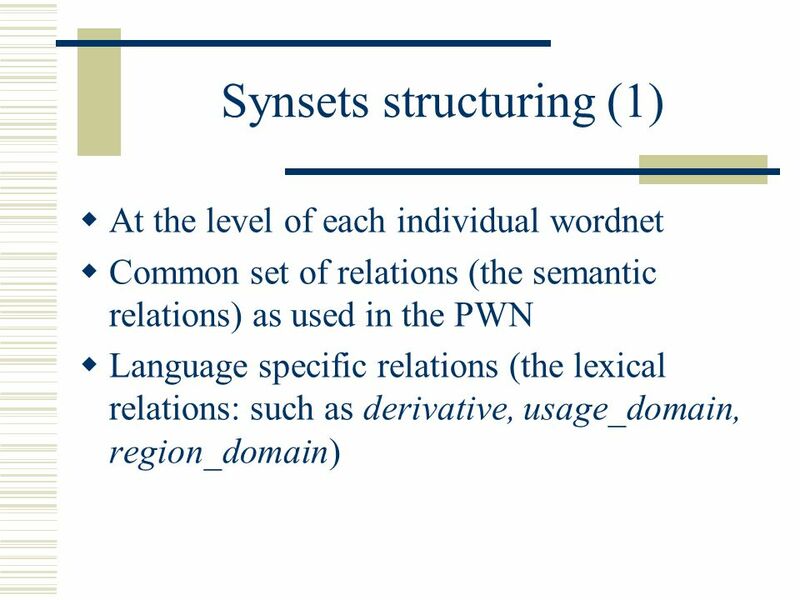 Dicts + Syn. 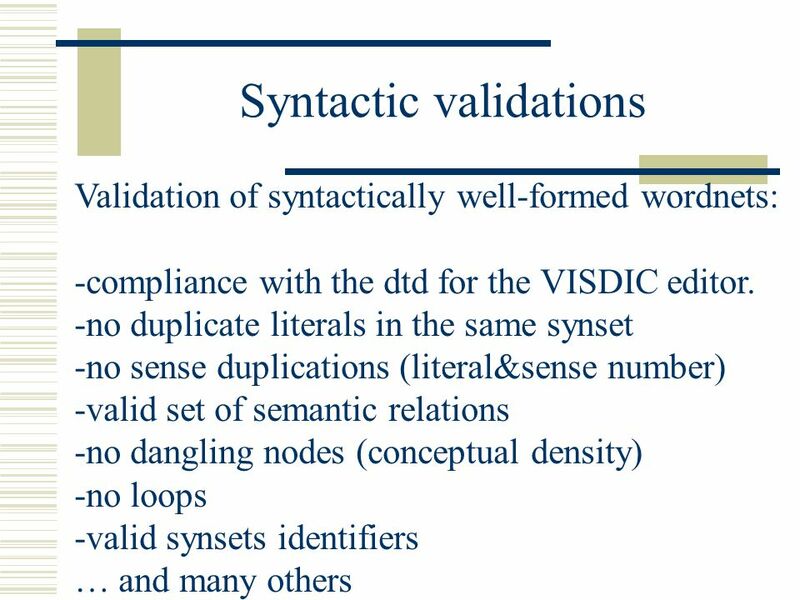 Dicts + Antonym Dicts + etc.) 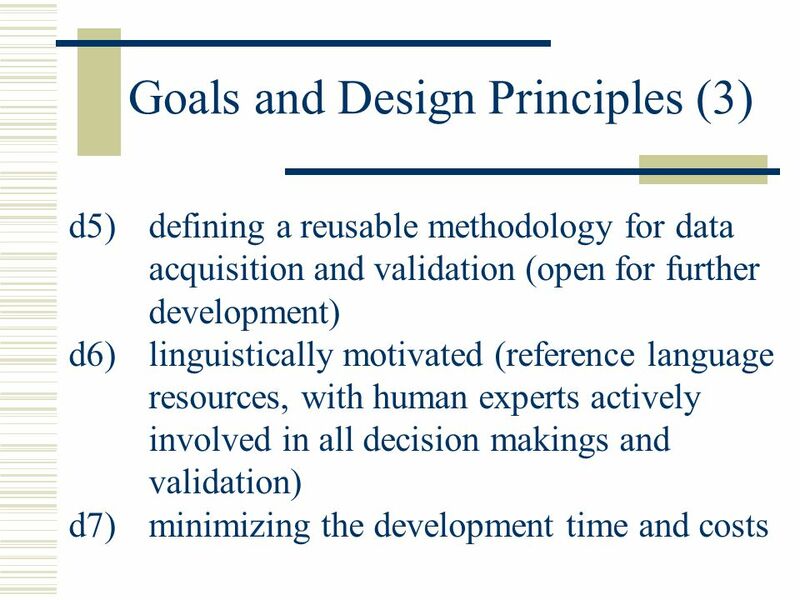 were available, the development effort concentrated to a large extent on equivalence interlingual mappings. 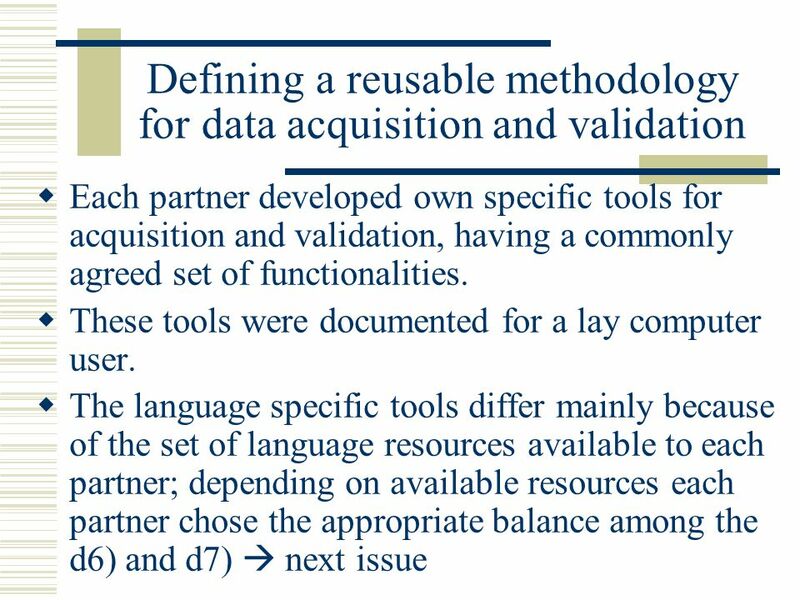 This approach allowed a more language centric development (merge model). 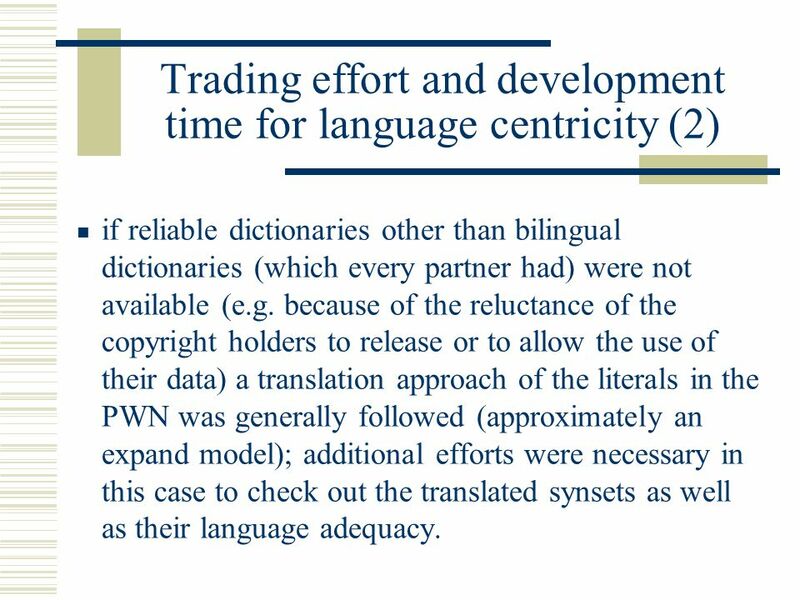 15 Trading effort and development time for language centricity (2) if reliable dictionaries other than bilingual dictionaries (which every partner had) were not available (e.g. 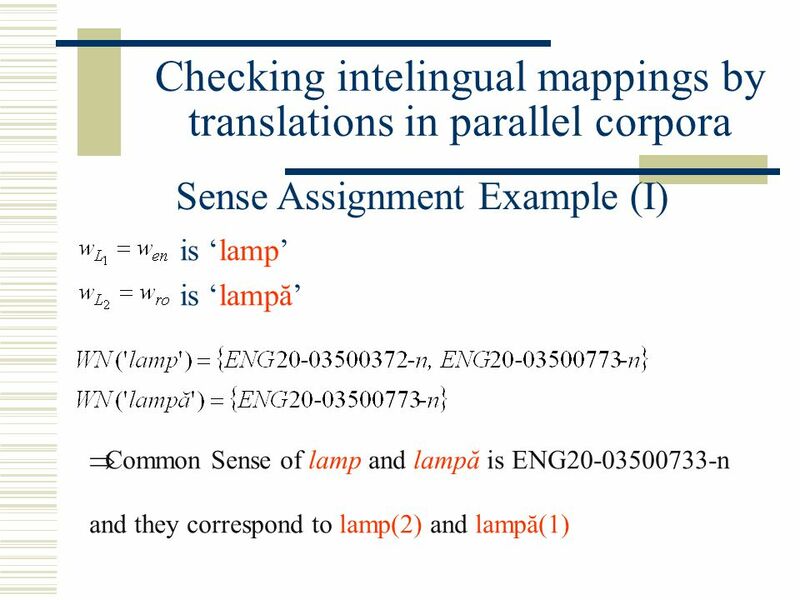 because of the reluctance of the copyright holders to release or to allow the use of their data) a translation approach of the literals in the PWN was generally followed (approximately an expand model); additional efforts were necessary in this case to check out the translated synsets as well as their language adequacy. 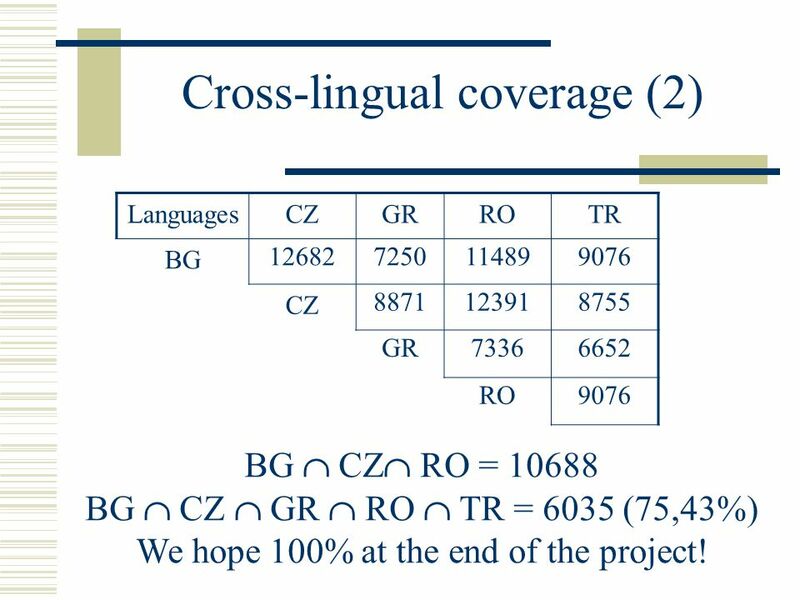 29 Cross-lingual coverage (2) LanguagesCZGRROTR BG 126827250114899076 CZ 8871123918755 GR73366652 RO9076 BG  CZ  RO = 10688 BG  CZ  GR  RO  TR = 6035 (75,43%) We hope 100% at the end of the project! 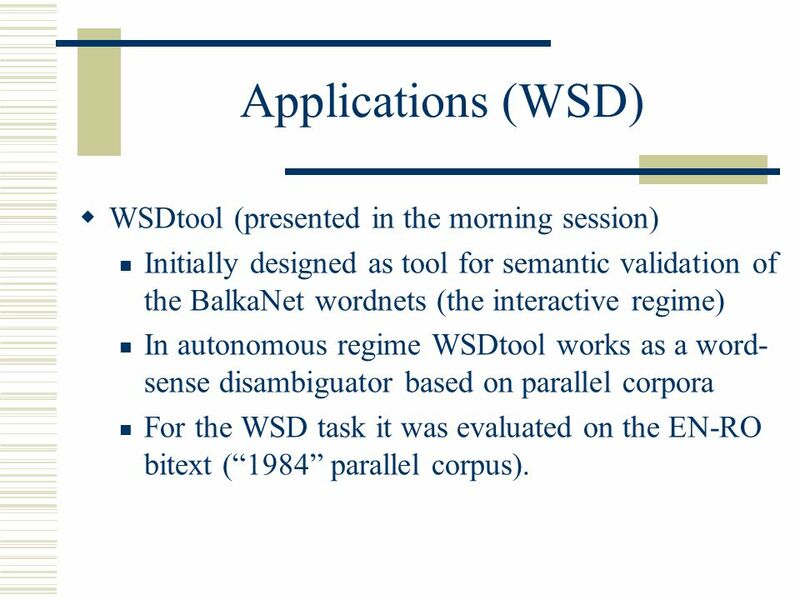 30 Applications (WSD)  WSDtool (presented in the morning session) Initially designed as tool for semantic validation of the BalkaNet wordnets (the interactive regime) In autonomous regime WSDtool works as a word- sense disambiguator based on parallel corpora For the WSD task it was evaluated on the EN-RO bitext (“1984” parallel corpus). 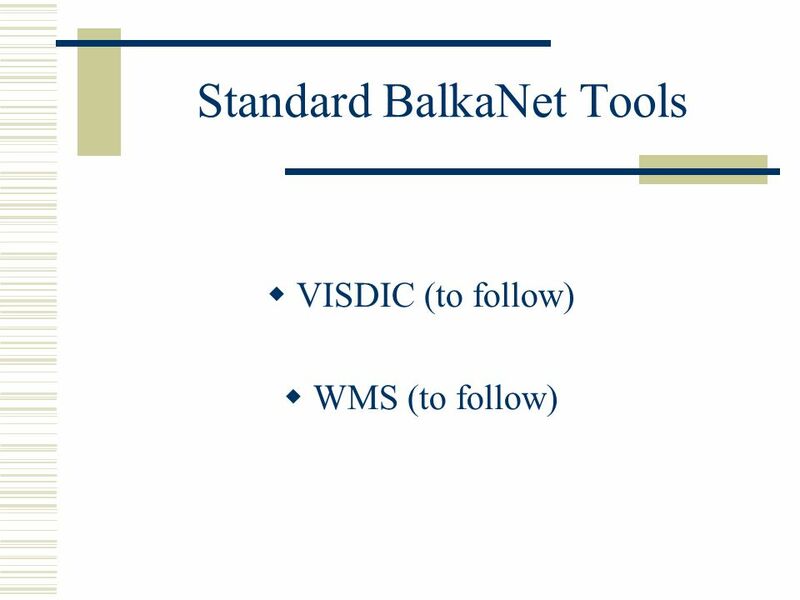 Download ppt "BalkaNet project overview Dan Tufiş Dan Cristea Sofia Stamou RACAI UAIC DBLAB." 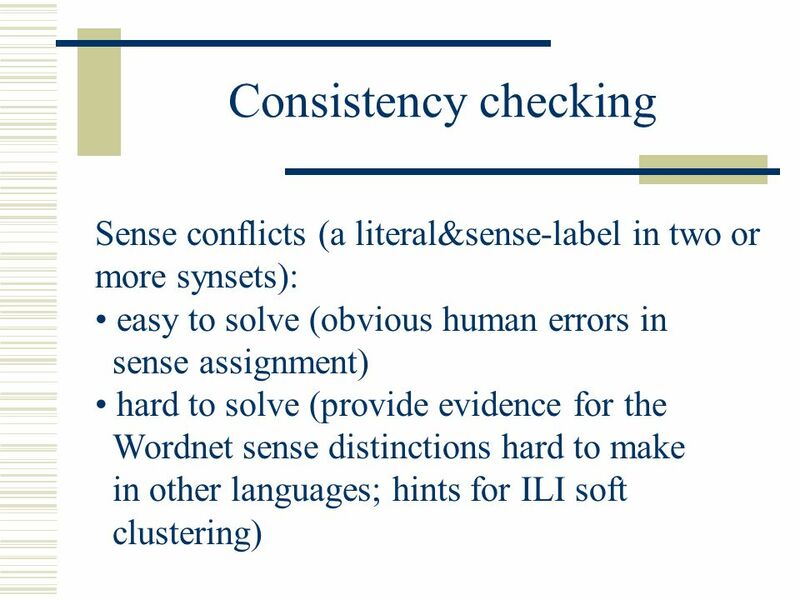 Building Wordnets Piek Vossen, Irion Technologies. A centralized approach to language resources Piek Vossen S&T Forum on Multilingualism, Luxembourg, June 6th 2005. 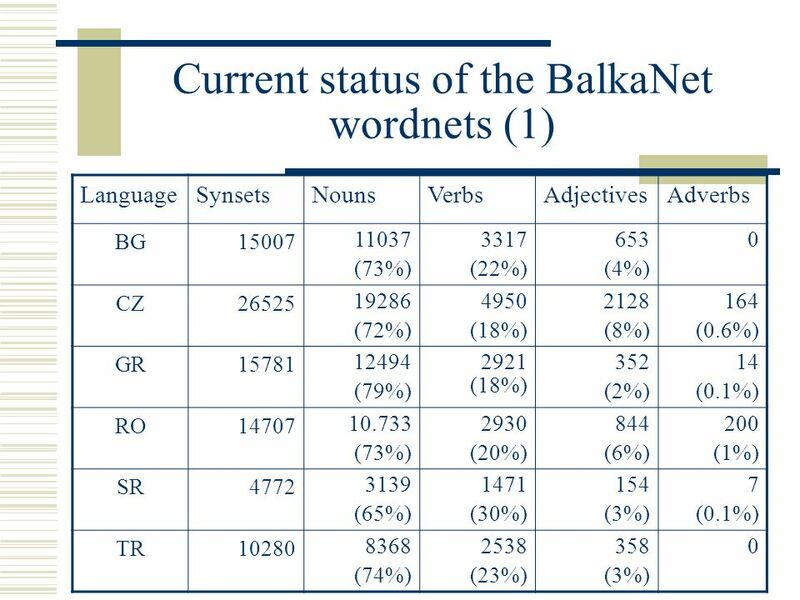 Wordnet Development Using a Multifunctional Tool Ivan Obradović, Ranka Stanković University of Belgrade Faculty. 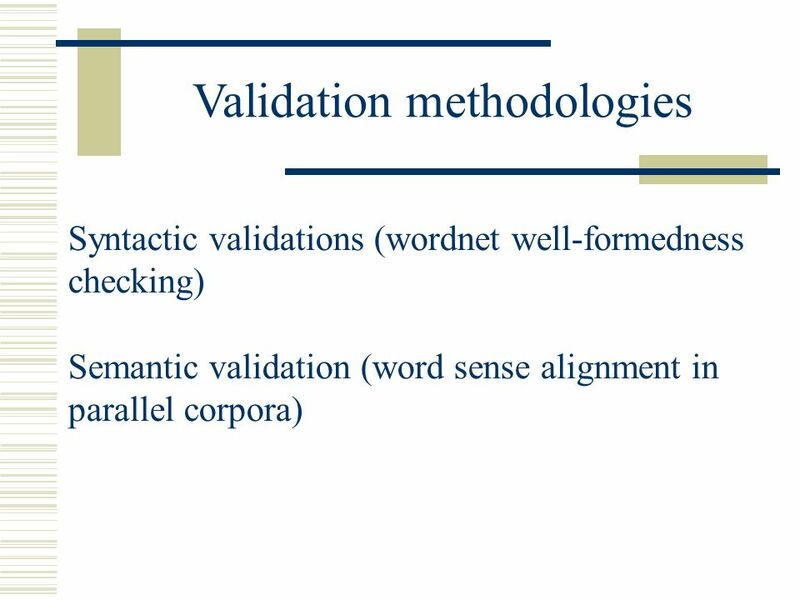 On-line Compilation of Comparable Corpora and Their Evaluation Radu ION, Dan TUFIŞ, Tiberiu BOROŞ, Alexandru CEAUŞU and Dan ŞTEFĂNESCU Research Institute. 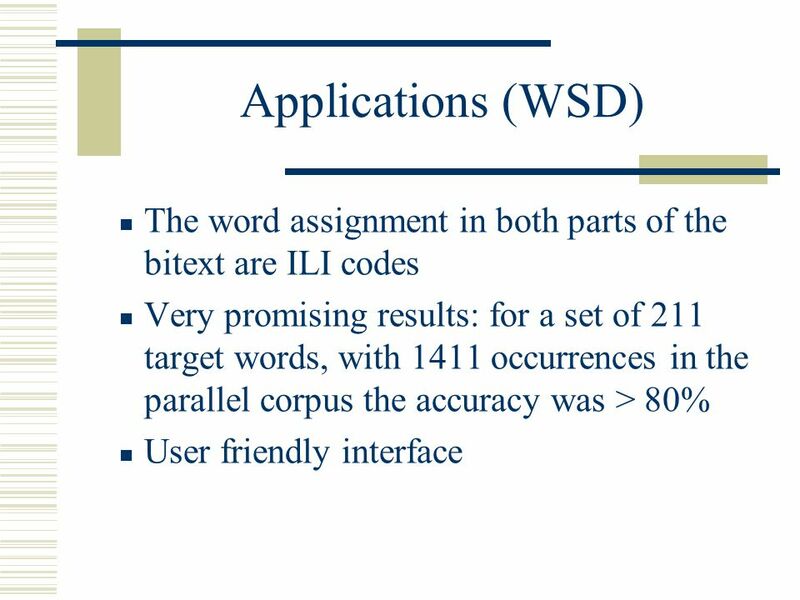 The WordNet Lexical Database Bernardo Magnini ITC-irst, Istituto per la Ricerca Scientifica e Tecnologica Trento - Italy. Building a Large- Scale Knowledge Base for Machine Translation Kevin Knight and Steve K. Luk Presenter: Cristina Nicolae. Ewa Rudnicka, Wojciech Witkowski, Maciej Piasecki G4.19 Research Group Institute of Informatics, Wrocław University of Technology nlp.pwr.wroc.pl plwordnet.pwr.wroc.pl. 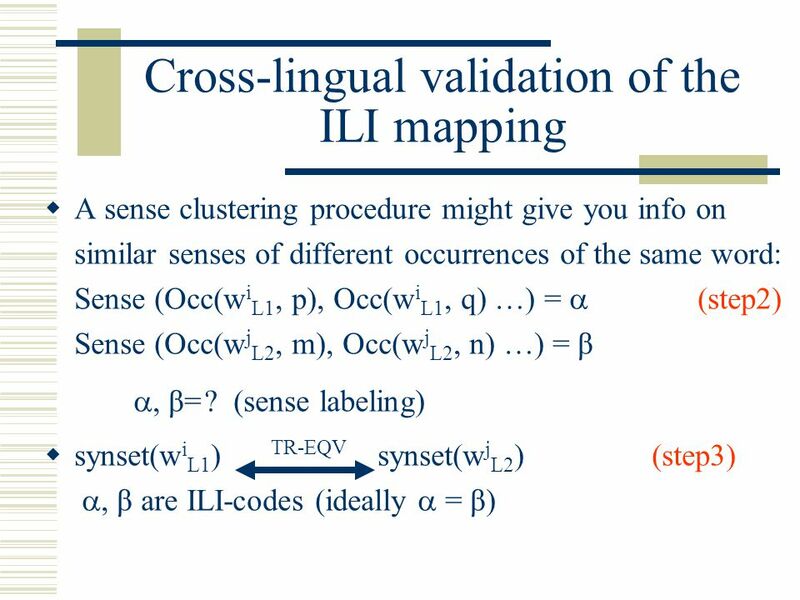 Building an Ontology-based Multilingual Lexicon for Word Sense Disambiguation in Machine Translation Lian-Tze Lim & Tang Enya Kong Unit Terjemahan Melalui. 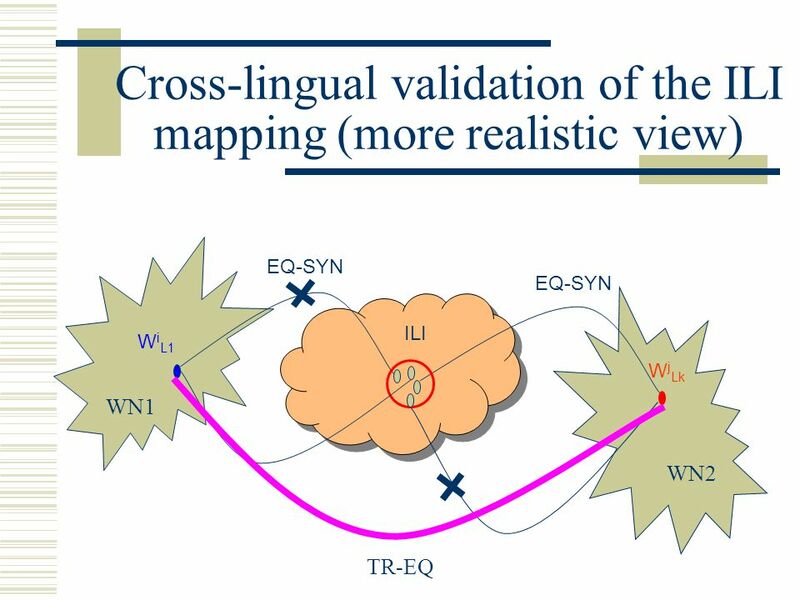 January 12, Statistical NLP: Lecture 2 Introduction to Statistical NLP. 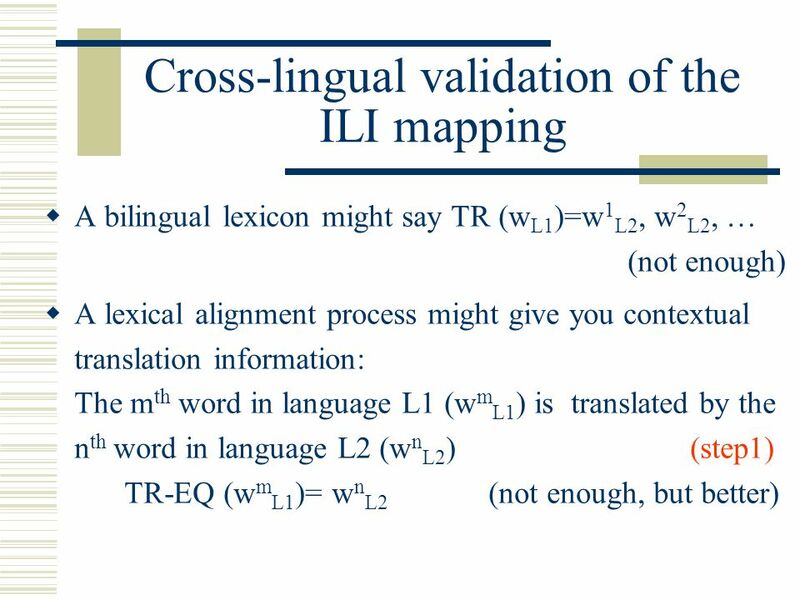 1 Noun Homograph Disambiguation Using Local Context in Large Text Corpora Marti A. Hearst Presented by: Heng Ji Mar. 29, 2004. 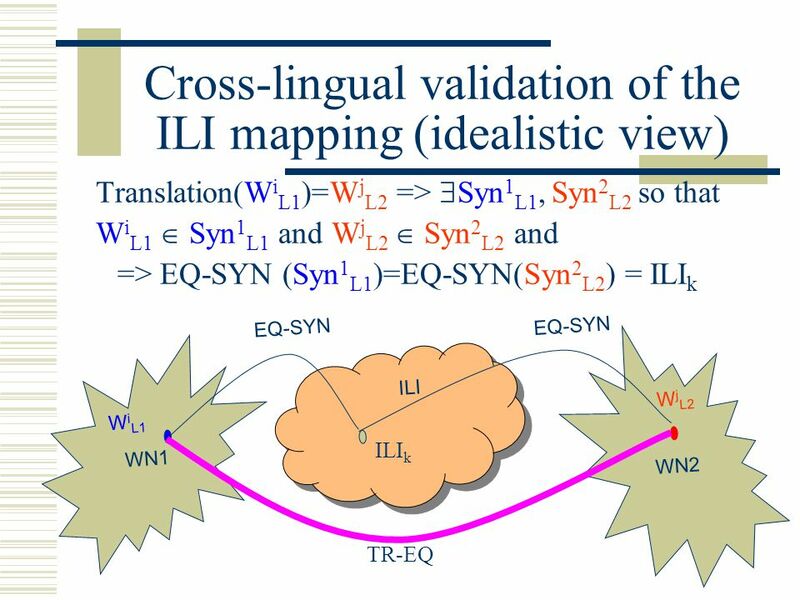 Creating a Bilingual Ontology: A Corpus-Based Approach for Aligning WordNet and HowNet Marine Carpuat Grace Ngai Pascale Fung Kenneth W.Church. 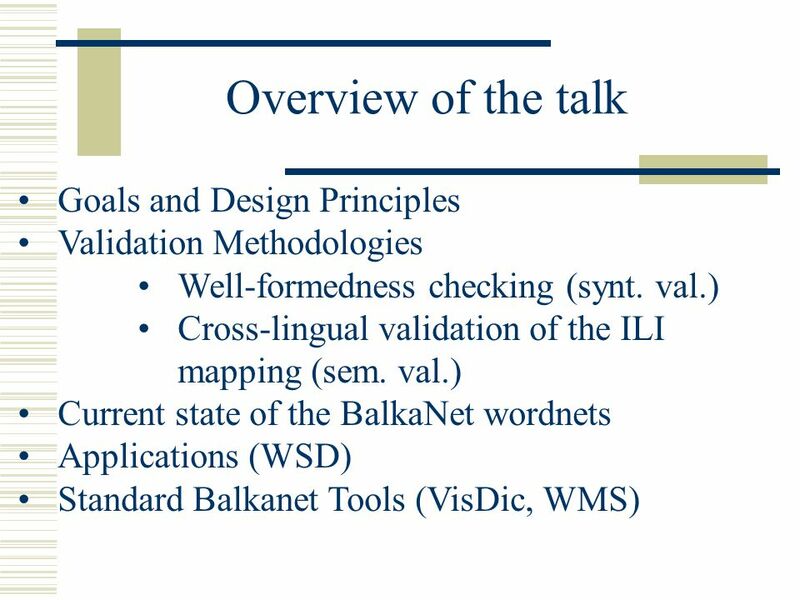 Designing clustering methods for ontology building: The Mo’K workbench Authors: Gilles Bisson, Claire Nédellec and Dolores Cañamero Presenter: Ovidiu Fortu. 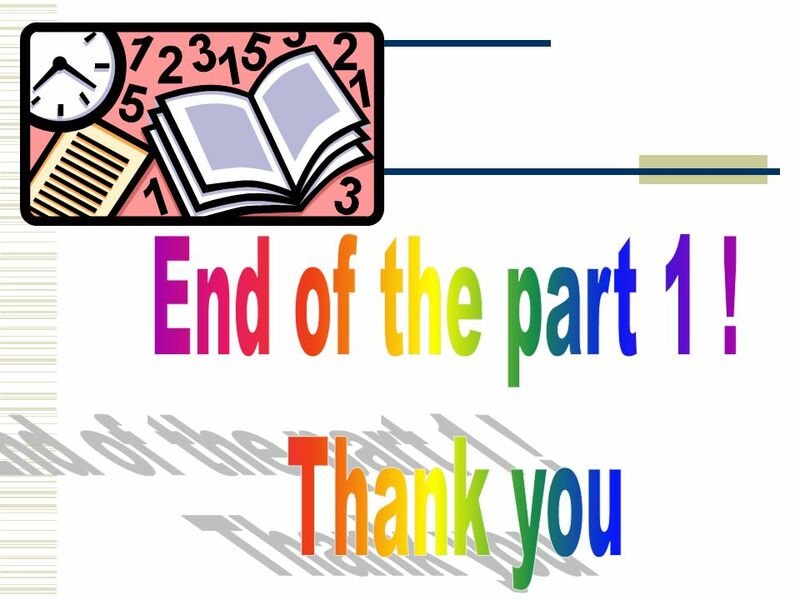 Resources Primary resources – Lexicons, structured vocabularies – Grammars (in widest sense) – Corpora – Treebanks Secondary resources – Designed for a. 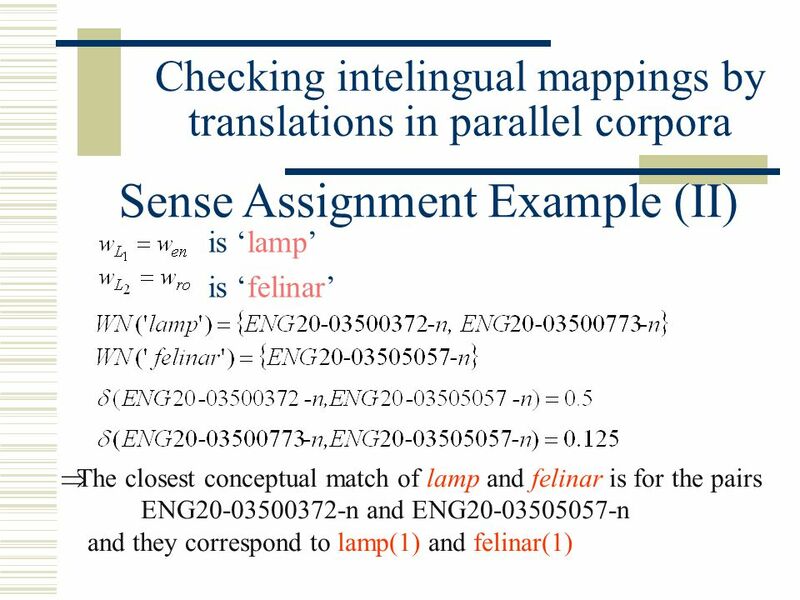 Comments on Guillaume Pitel: “Using bilingual LSA for FrameNet annotation of French text from generic resources” Gerd Fliedner Computational Linguistics.